Each day at Rare Newspapers brings new discoveries. Today we found an item which is quite historic. In 1903, the battle between Thomas Edison and Nikola Tesla (and Westinghouse) as to which form of electrical current (DC or AC) was to become the standard, was largely decided – with Edison’s DC current being the loser. Not willing to give up without a fight, Edison attempted to win public and political support by stressing the greater danger of death by electrocution from contact with AC current. 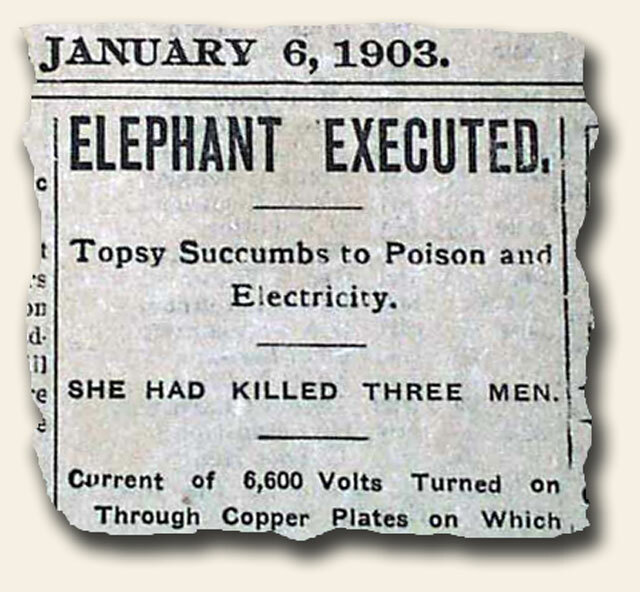 In a highly publicized dramatic event, Edison organized and helped supervise the filming and electrocution by AC current of Topsy, a Coney Island circus elephant which had recently killed three men. 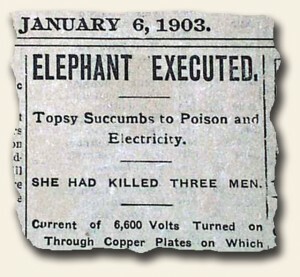 While the execution was successful, and was overseen by the Society for Prevention of Cruelty to Animals, Edison was highly criticized for the event which did not accomplish his desired goal. The report was found on the front page of the ALLEGHENY COUNTY REPORTER, Wellsville, New York, January 6, 1903. I wonder if the S.P.C.A. would support such an action today?